InstaForex has launched an awesome Match Hero contest especially for football fans! We offer you the opportunity to guess who will become the best player of every Liverpool FC EPL game and go on the summer tour of the team to meet with the match hero. Before every game, choose four players who can become, in your opinion, the best footballers, gain points for the correct forecast and get your chance to meet the stars of Liverpool. The posh exclusive car is waiting for you! InstaForex raffles the legendary next-generation Lamborghini Huracan. Seize a chance to get it! The campaign will be held from December 26, 2016 to December 20, 2019. This contest, blending football and trading, is organized in cooperation with world-known Liverpool FC and Jason McAteer, the team´s star of 2000s. The trading instrument is a binary option the terms of which are based on an outlook given by the InstaForex team for results of games played by Liverpool FC in the English Premier League. Take part in the contest and you will have a chance to visit the home stadium of the legendary British football club. The unique online beauty contest is already in full swing! Charming ladies from around the globe have already entered the competition for the crown and great prize. Do not blow your chance! Welcome to register for Miss Insta Asia, the top-rated online beauty contest. The Beauty Queen title 2017 is still vacant. The contest is held annually. Its total prize pool is $45,000. 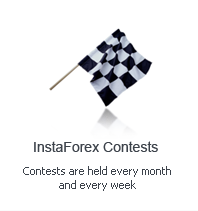 InstaForex has determined the winner of Jaguar F-Type - the powerful British sports car. The "Don't dream it, win it! Jaguar F-Type from InstaForex" campaign which was held from 27 October 2014 to 31 October 2016 is over. To learn details and results of the campaign, visit the official web page.